Should You Be Buying Organic? Every year the Environmental Working Group publishes the Shopper’s Guide to Pesticides in Produce™. Derived from USDA tests, they found a total 230 different pesticides on thousands of fruit and vegetable samples examined in 2018. The pesticides persisted on fruits and vegetables tested by USDA – even when they were washed and, in some cases, peeled. Buying organic produce helps to avoid these pesticides that can be harmful to your health. According to the 2018 Environmental Working Group’s Shopper’s Guide, strawberries have officially replaced apples as the most pesticide-ridden produce. 99 percent of strawberry samples had traces of at least one pesticide and the dirtiest strawberry sample was found to contain 20 different pesticides. The consumption of pesticides can lead to reproductive health complications in both men and women. Protecting your family from consuming harmful pesticides used when buying foods is a primary concern for many but, how do you know when it is important to buy organic and when it’s not? Here are a few tips to help protect both your family and your wallet! The dirty dozen is a list of the top twelve fruits and veggies that tested positive for higher concentrations of pesticides than other produce. More than 98 percent of strawberries, spinach, peaches, nectarines, cherries, and apples tested positive for at least one pesticide residue. If you are not already, you should consider buying organic beginning with these top twelve produce items. Remember, the thinner the skin, the more likely it is that pesticides can leak through. Fruits and vegetables on the clean 15 are not absolutely necessary to buy organically because they bore little pesticide traces. No single fruit sample from the Clean Fifteen™ tested positive for more than 4 types of pesticides. Multiple pesticide residues are extremely rare on Clean Fifteen™ produce, with avocados and sweet corn being the safest options. Only 5 percent of Clean Fifteen samples had two or more pesticides. Washing produce helps reduce the number of pesticides and germs that have accumulated on the fruits and vegetables during growing and transport to your home. Always wash produce, even if it is organic! Making your own produce wash is an easy, inexpensive way to protect your family and save some money. Directions: Fill a bowl or spray bottle with equal parts vinegar and water. (The acetic acid in vinegar kills bacteria and helps to dissolve the wax and pesticide residues found on the skins of many fruits and vegetables.) 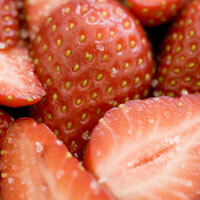 Spray the wash onto your fruits and vegetables with thick skins and use a sponge or scrub brush to rub it in. For produce with softer skins, allow the fruit and vegetables to soak in a bowl of the wash for a minute or two. Always rinse with fresh water after cleaning the produce in the solution.